There are many ways a recipe comes to your home. Sometime you look for it, sometimes they come home with you and sometimes it's already there even before you know it. That happens more than once when your ancestors were as enthusiastic cook as you are. This is particularly true for me. Even before I could pronounce the word 'cooking' I was fed well and was pampered with variety. My grandmother whom we lovingly refer as 'Dida' was an avid cook and that combined with the transferable job of my Grand father resulted in a collection of recipes acquired from various regions of India. She cooked Macher jhol and Chicken do piyaza with equal Elan. 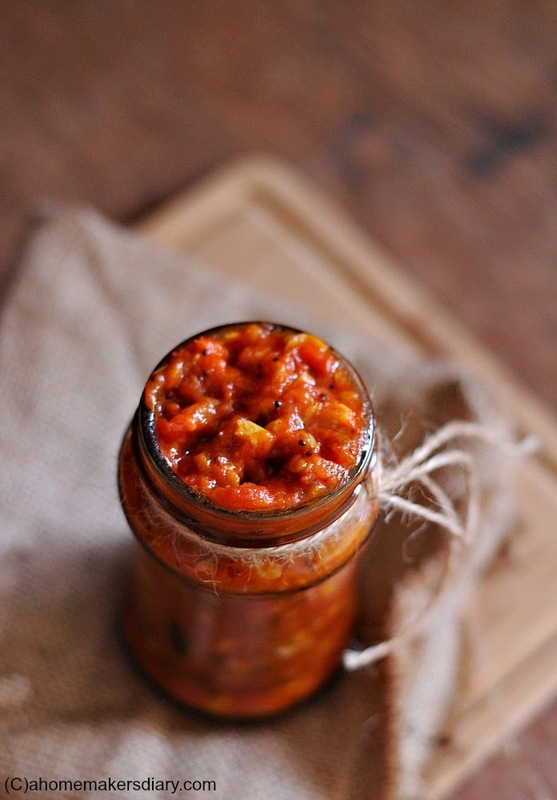 Take this Tomato Chutney for instance, known as tomato sauce in our family. 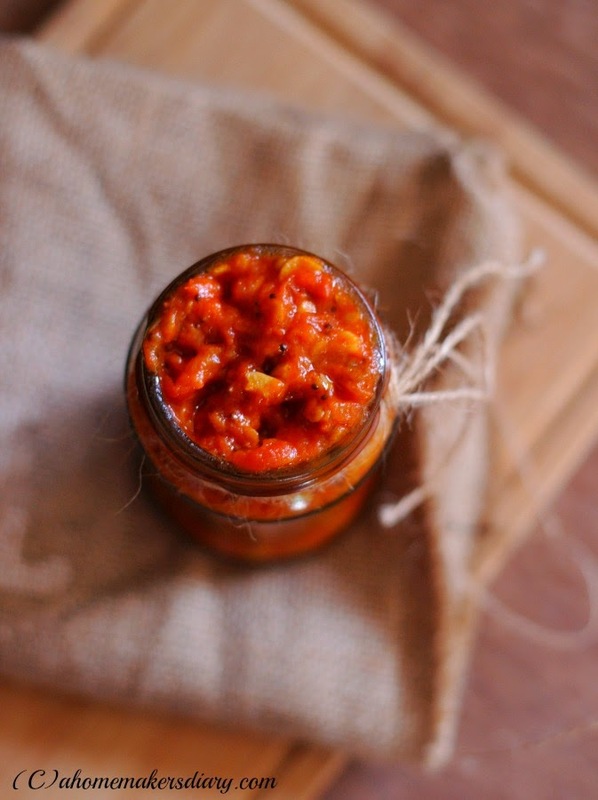 This is nothing like our sweet Tomato Chutney that all Bengalis relish after a scrumptious meal. It's rather is everything opposite a tomato chutney is, It's like a savory tart version Which is needed to be made fresh each time. The garlic, The chillies give it a certain savoury kick and I have had this all my life as a sides with Besan chilla and Gola ruti. It's untill very recently that I ever paid heed to the fact that it's so similar to South Indian Tomato thokku. May be Dida picked up the recipe from some of her neighbours and as curry leaves were almost rare in those days, she changed the recipe to suit the circumstances. May be, may be not, only if she were around to confirm. I miss her so badly. I specifically remember how all my friends and collegues used to drool on it and how, many of them have taken the recipe from me. Though not all of us are in touch anymore I believe hopefully that recipe had stayed on in their life with a little memory of me. After marriage I found another admirer of this savory tart chutney in my husband. This man loves evrything tart and flavourful and no wonder soon after his first taste he wanted me to make bigger batches of it to stack away in fridge. That was the time when I thought of trying out the pickle version of this. So here it is with little more shelf life. Best if you store in fridge...that way it easily lasts upto 3 weeks. Just to be clear my family's recipe does not use Curry Leaves or mustard. It's my husband's love for this flavour that I added them here. Remove the eye of the tomatoes and chop them fine, sprinkle salt all over it and keep aside. Finely chop the garlic and keep aside. Heat the oil in a heavy bottom pan and add mustard seeds, methi seeds, hing and curry leaves. Once they start to splutter add the garlic. Cook till they turn golden and then add the tomatoes, the chili flakes and turmeric. Mix and cover. Let it get soft under the lid for 7-8 minutes. Stir in between. Once they turn mushy, mix properly with your spatula. Adjust the salt and cook even more till oil starts to ooze out at the sides, another 5-7 minutes. Cool in the pan itself. if you see juices have come out after cooling you need to cook it some more till you see oils coming out. Cool, store in sterilised bottle for upto 3 weeks in Fridge. We love it with anything and everything. Rice, Roti, Idli, Upma, Paratha, Appams etc. 1. 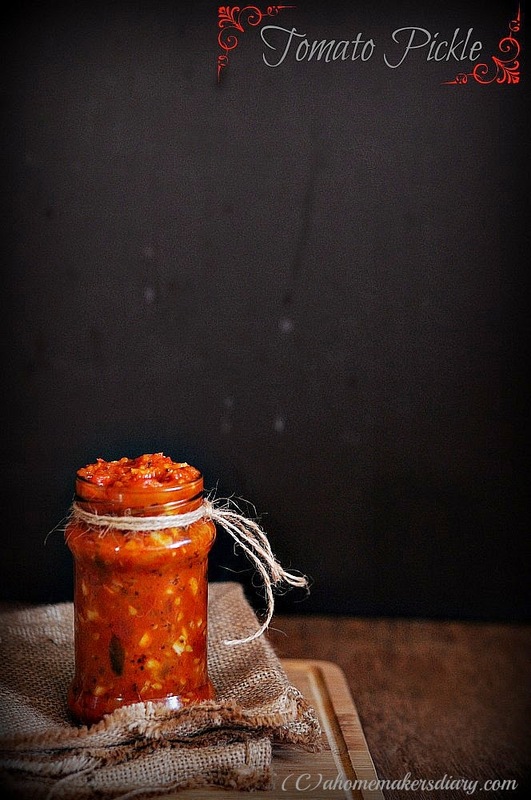 Here is my family's tomato sauce recipe which has a different flavour. Use same amount of tomatoes, garlic mentioned in the recipe above and use green chillies for heat, turmeric and salt. Follow the same method just skip the tempering part with curry leaves and just add chopped garlic and chillies to the oil. Once they are fragrant add the tomato and cook similarly. 2. Use more oil if you plan to keep it outside. The amount of oil should be such that once cooked the tomatoes should be drowned under a layer of oil. 3. My mother often grinds the tomato for a smother texture. Slurp.... I can have tons of it with dosa's.